This property is directly associated with the period of reconstruction and commercial redevelopment (1889-1902) that took place during the decade after the 1889 fire, which destroyed 64 blocks of commercial and waterfront industrial buildings. While the reconstructed commercial district remained fixed within five blocks of Yesler Way and First Avenue, substantial commercial construction began to gravitate further north along First and Second Avenues and toward the well-established residential district that survived the fire. By 1900, more than 29 street railway or cable car lines were in operation, many constructed by private entrepreneurs to promote suburban residential real estate holdings. The expeditious development of suburban residential neighborhoods after the turn of the century occurred in tandem with the rapid northern expansion of the commercial district and the gradual absorption of the old residential area by commercial real estate development. None of the older residential properties and very few intact commercial properties dating from this era remain within the downtown commercial core. Buildings specifically designed to be devoted to specialty retail or department store use typically included lower floor level commercial display spaces and upper floor level loft, sales and/or storage areas. The larger department store buildings were typically masonry construction and three to five stories in height, exhibited either a two or three-part commercial block facade composition, and were further dignified by prominent cornices and storefront canopies. This building type did not require as much natural light and ventilation as neighboring business blocks and hotels; thus, lot coverage and building mass could be maximized. Specialty retail and department stores typically required more elaborate interior finishes and fittings, as well as more elaborate exterior construction with large display windows in order to exhibit merchandise and often included ornate canopies or awnings providing pedestrian protection. 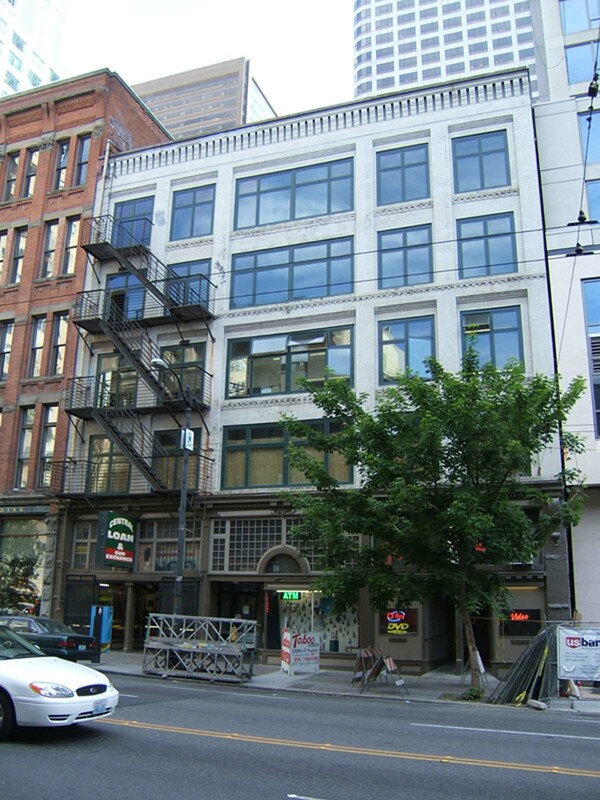 The Schoenfeld Furniture Store Building is one of the oldest extant commercial buildings located along First Avenue north of Pioneer Square and is a particularly well preserved example of an early specialty store. The Standard Furniture Company was originally established by Louis Schoenfeld in 1864 in Virginia City, Nevada. After relocating to Seattle in 1887, this enterprise grew to become one of Seattle’s leading business institutions. The initial Seattle store was housed in a single storefront space in the Occidental Hotel, at Second Avenue and Yesler Way, which measured some 40 by 80 feet. The company sold eastern-fabricated furniture described as “highly polished chairs and rockers, art goods, music stands and cabinets’ that were shipped around the Horn to Seattle via San Francisco. After the 1889 fire destroyed that shop, the company was left with only one wagonload of salvaged merchandise; however, they were able to obtain addition merchandise from San Francisco and set up business in large tent located at Second Avenue and University Street. After reconstruction, they moved to a space in the New York Block (1892, destroyed) at Second Avenue and Cherry, and then moved to a location on Western Avenue near Madison Street before having this building constructed c.1900, possibly earlier given its design character. This six-story store and loft building was designed by the architecture firm of Thompson and Thompson. Charles L. Thompson and his son C. Bennett Thompson began to practice in Seattle in 1898 and are know to have designed several local business blocks including the Sartori Block (Moses Building, c.1900), hotels, residences and a synagogue prior to 1912. However, by 1906 the booming furniture business had absorbed and outgrown all of the room available within this building. The company decided to construct a major new store building at Second Avenue and Pine Street on what, by 1906, was a newly regraded and not a particularly attractive site. Many of their fellow businessmen questioned the wisdom of establishing a business of this size so far north of University Street. When the ten-story Standard Furniture Company Store and warehouse building opened in March 1908, it was the largest highrise commercial building to be constructed north of Pike Street and the first large retail enterprise in the new northern retail district. The opening event is reported to have drawn 5,000 people who toured the building. It is not known for what purposes the Schoenfeld Furniture Store Building was used after the company moved to their new store building in 1908. By 1937, the subject building was known as the Meves Building and primarily housed the Horseshoe Clothing Company which sold (and possibly fabricated) fisherman’s and other outdoor clothing, and a magazine store. By 1924 the Standard Furniture Company, which also operated a large store in Tacoma, was the largest home furnishings enterprise in the Pacific Northwest. By 1929, the company employed some 225 people at their downtown location, 20 at a University District branch, and another 100 at the Tacoma store. The company also operated a furniture factory (Washington Furniture Manufacturing Company0 with another 100 employees. Part of the success of the company was that they innovated selling on credit, offered furniture rental programs and operated a mail order bureau. Louis Schoenfeld‘s three sons (Ralph A., Berman and Herbert A.) helped to establish the company and carried on its operations for many years after his death in 1910. Grandson Berman Schoenfeld, Jr. succeeded his father and two uncles in operating the company. Upon his death in 1953 the firm was operated by the family estate for a short period before it was then consolidated with the Grunbaum Furniture Company in 1954. The business was sold entirely to the Grunbaum Furniture Company in 1958, which was then bought out by the Bon Marche. This is an intact and rare example of a particularly important downtown retail and specialty store property type from this era. Furthermore, it is associated with a person of significance, Louis Schoenfeld and a significant local retail enterprise. Located mid-block on the east side of First Avenue between Madison and Spring Streets, this six-story commercial block includes three retail stores and upper floor level office space. It measures 60’ x 112’ and the modest stacked vertical block façade composition exhibits five window bays oriented toward First Avenue. The exterior is virtually unaltered and appears to have been maintained and has not been renovated or remodeled to any great extent. The brick masonry and concrete structural system (with a concrete foundation) is clad at the shaft with common brick that has been painted. The storefront level is remarkably intact and exhibits intact historic building fabric and features including; deep recessed entryways, low-wooden bulkheads, plate glass display windows, cast iron storefront members and ornate brackets, multi-pane mezzanine level windows and an ornate/bracketed intermediate cornice. The shaft is accentuated by an intermediate cornice below the third floor level windows that serves to divide it horizontally into two matching parts with a common fenestration pattern. A wide central window bay is flanked to each side by two narrow bays, each with large recessed two-story window bays accentuated by corbelled brick headers and denticulated sills/spandrels. Simple unframed window openings hold what appear to be original windows and/or in-kind replacements that closely match the original 2/2 form/configuration. An historic steel fire escape remains in place within the two northernmost window bays at the upper four floor levels. The building shaft is capped by a simple corbelled brick cornice with a distinctive dentil course treatment. Slight alterations have been made to the southernmost storefront bay. There do not appear to be any architecturally significant interior building features, finishes or public spaces, however further field inspection may be warranted. Sandborn (Insurance) Map Company, Seattle, Washington. Main Business District - Seattle, Periscope Map Co., 1903. Seattle of To-Day, Illustrated. Seattle: National Publishing Company, ca. 1908, pg. 222.